I usually like to celebrate upcoming seasonal ingredients with my recipes. However, with spring taking her dear time, I decided to acknowledge the colder months with the sunchoke. The sunchoke is available year round but its popular months are January to April. They are also known as Jerusalem artichokes, a very misleading name because they aren’t anything like an artichoke, and have nothing to do with the Israel. This humble root vegetable is easy to miss at the farmer’s market or grocery store because they’re not all that attractive. They look similar to a ginger root, are starchy and hearty like a potato but they have their own unique sweet flavour. They’re also super nutritious, high in fiber, iron, potassium, and antioxidants. As a distant cousin to a potato they can also be prepared similarly. I adopted the method for crispy smashed potatoes and applied it to the sunchoke. It’s by far my favourite way to enjoy them! I’m a garlic lover, which is why I prepared garlic two ways in this recipe. Cloves are both minced and roasted whole. Try to buy garlic with larger cloves so the garlic is more mushy than crispy after it’s roasted. Some of the minced garlic will stick sure to the bottom of the pan. Make sure you scrape up these garlic crispy bits because they’re delicious. Preheat oven to 450°F and line a baking tray with aluminum foil (You can also leave the baking sheet bare). Fill a large pot halfway with water and season generously with salt. Add the sunchokes and bring to a boil. Allow to boil for 10 minutes. Drain with a strainer and allow to cool for 10 more minutes. Slightly flatten sunchokes with the bottom of a glass, you want to expose their insides but have them remain intact. 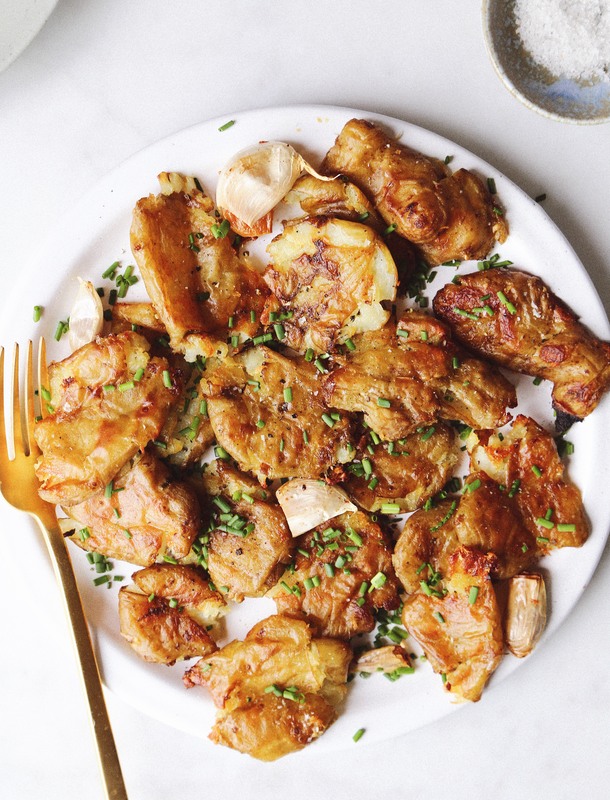 Place sunchokes on baking tray and gently toss with garlic oil and garlic cloves. Season with salt and pepper. Roast sunchokes on each side for 15 minutes, until golden. Season with more salt, pepper, and chives. Serve hot! This entry was posted in Starters/Sides and tagged chives, easy recipe, farmers market, jerusalem artichokes, spring, sunchokes. Bookmark the permalink.